Discussion in 'New Leaf' started by Platypus, Apr 1, 2017. 「BORUTO -NARUTO NEXT GENERATIONS-」がついに小説化!! TVアニメと連動した"アカデミー"での物語!! Seems to be a novelization of the upcoming TV anime's "Academy" storyline. 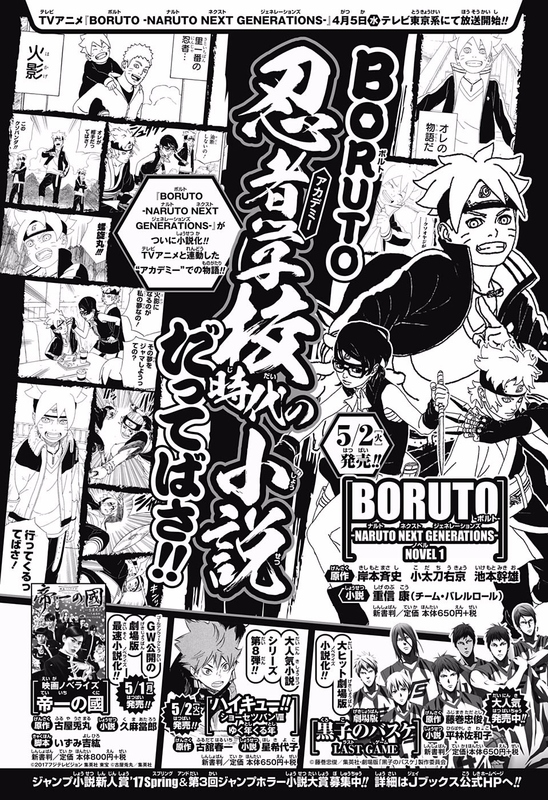 The summary on the site is just fluff about which characters are involved (Boruto, Sarada, Shikadai, Inojin and Chouchou), restates that the novel is set during the Academy days, and says to look forward to the TV anime. Gotta milk that cashcow dry. The novels thing for Naruto sure got trendy. So, like... An adaptation of an adaptation? Of a sequel? Hey, we might get a musical next. Who's actually going to read this? And then it should go full circle with the musical getting adapted into a manga. All that needs to happen is Sasuke kicking Boruto in the balls so hard that it kills the banana boy within the opening pages for you to go to Japan to not just buy that book but have it signed. How embarrassing. Guess that's business. I don't understand how they could. Despite the Boruto Manga sales lacking compared to Naruto, how will this Novel even fair in terms of $? Plus Naruto wasn't the main money maker. They have a lot more than Naruto that racks in the (They are under Shueisha). Still it does seem like a bad opportunity to make some easy cash. A novel about an anime arc ( which sole purpose is to fill the void until the manga is advanced enough). Oh and also they didn't forget to put the name of the manga authors ( ikemoto, ukyo, masashi) so peeps might thinkg it is somehow relevant. Sure, they might start sexualizing Pan and Bra in Dragon Ball Super next. so who is gonna draw the cover for it? kishi, ikemoto, sp? recycled images? Oh and also they didn't forget to put the name of the manga authors ( ikemoto, ukyo, masashi) so peeps might thinkg it is somehow relevant. Isn't that's just copyright law? No different from, say, new Star Wars movies crediting George Lucas even though he's no longer involved and doesn't even own the franchise anymore. Is this art supposed to be for the novel? One good laugh before bed. Night!